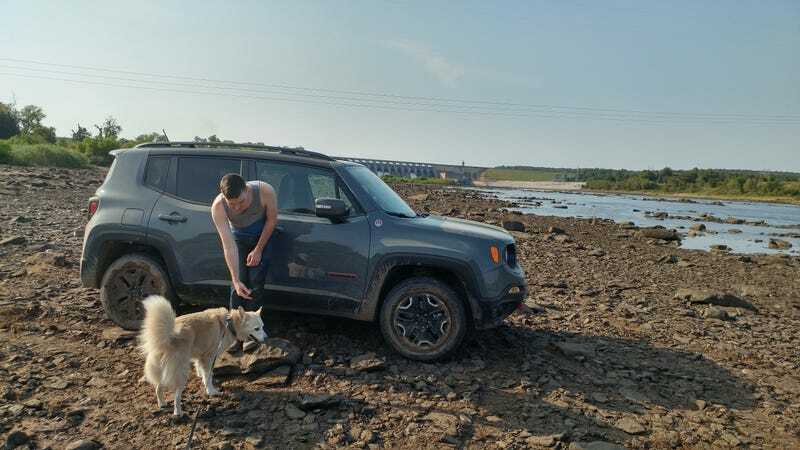 With the postponement of our next cheap car adventure it was decided that we’re doing an overland adventure in April, this time with two twists: I’m taking my 1986 Honda Civic 4WD Wagon and I am also taking my model-year 2010 doggo, Dog A. This will be... interesting. First and foremost, I need to make sure the Wagovan is fit for a long drive like that. This means continuing to drive it as much as possible, for the most part, to see if I can smoke some monsters out. The first monster that has been smoked, is a loud clanking noise on the right front when going over bumps. This appears to only happen when I have a passenger. So yeah... step on is to get this thing up on jack stands and see whats what on the suspension. Additionally, I haven’t done anything to the cooling system, so I am looking at replacing any and all hoses I can get my hands on, the overflow reservoir, cap, and coolant. This is mostly precautionary. I’m also planning doing an oil change on the engine, transmission, and diff to make sure we have a good baseline, plus new accessory belts (the timing belt looks good). The only off-road “mod” I am planning is bigger wheels and tires. I have the wheels sorted, now I just need to confirm the tires will fit. Luckily that and checking the suspension can be done at the same time. Stock, the car comes with 175/70R13 tires wrapped around 13" steel wheels. Luckily, that appears to be an exceptionally tall tire for a 13" wheel. According to randos on the internet, a 195/60R15 should fit, no problem. For better or worse, the best size seems to be a 185/60R15, which has a wide availability in a truck tire. This gives me about an inch over stock and should increase my ground clearance by 0.5". Will it fit? No idea! I hope so and I have a date with a jack and a ruler to try and find out. I’m eyeing these General Grabber, though Continental also makes an aggressive looking truck tire for a bit more money. So, with that in mind... why not make it a comedy offroader!? Stock 4th Gen Civic Beagle. Swoon. Basically the plan here is to bolt on as much off-road crap as my budget will allow. Ideally this would be stock or custom front push bar, rally lights, and a roof rack with roof mounted full sized spare. Sadly... every one of those items is both unnecessary and expensive. I probably will do some form of bull bar, either a real one or one of those bolt on front plate fake ones, and mount some lights to it iff I can confirm the alternator can take it. With a 55A stock alternator... well TBD. Maybe with some strategic LED swapping I can get some decent headroom. Might be a good excuse to buy a hall effect amp clamp! Roof rack appears to be a non starter. Everything I’ve seen you get into $500+ without too much effort and it just isn’t worth that to me. The Civic’s lack of stock rack and gutters really seems to limit the options and most vendors seem very proud of their stuff. If anyone knows how to kit that out on the cheap, I’m all ears! As for the full size spare, I am on the fence. I did attempt to buy a 5th wheel so I could have the option to fit one, but that fell through as the wheel was damaged. I could go pick one up, but I’m not sure how into spending an extra $120+ on a spare I am, when a plug kit would get me out of 90% of my problems and a donut would sort the rest. I don’t go out alone, so I’ll always have some helpers to limp me to the nearest tire shop. Here we get a little sticky. New wheels and tires will do a lot, as will any bolt on crap I put on it. The only other question in my mind is: to plastidip, or to not plastidip? I played around with the concept a bit and didn’t really reach a conclusion. I think it would be relatively straightforward to do, I’ve had success with it in the past, and it would look cool... I think. The downside is the Civic has a lot of hail damage that just doesn’t show up in pictures. I’d like to fix or minimize this before embarking on a dip. Color-wise, as much as I love the orange and the lime green, the interior color would stick me with either white or blue. I’m actually leaning towards white, maybe with some color-shift additives to make it look... ridiculous. Oh and I’ll need to get it an Oppo sticker... of course! The first one is a concern. We’ve already identified the “High Water Trail” as being both awesome looking and outside the scope of this trip. I hate the idea of being the least capable vehicle out there and being the reason we have to bail on a trail. I do take some comfort in knowing that bailing on a trail is better than pushing it and getting crippled on a trail. Live to fight another day, but I still don’t want to be the one to call it. I do take some comfort in that while I will be the least capable vehicle there, Kate will be a newb in her Cherokee and will probably want to ease into it some. Or that is what I’m telling myself, though I know she has taken it to the ORV park already. Either way, I’ll stand my ground that this was meant to be a Wagonvan trip from the beginning and any whining will be met with death pistol whipping withholding of whiskey dog pets. Number two sounds silly, but it will be April in Arkansas. Might be hot, might be cold, might be beautiful. Right now the Honda’s AC appears to be working fine, and that is great, but I’ve never given it a go on a hot day. Pair that with a Doggo and an impending R134a conversion (the Civic is R14) and we could be in trouble. Financial trouble, but still trouble. Ahh well. I might order an AC drier as a just-in-case and have my wallet prepared for the worst. Mechanical trouble is always a concern, but not one I can reasonably plan for outside of our usual emergency repair kit (I should do an article on that) and AAA. Route planning is going OK. This is George’s (Renegade) bread and butter, so I am letting him take the wheel. We’ve identified two potential AirBnB/ VRBO properties that will accommodate all of us plus the doggo and, as luck would have it, the cheaper of the two looks like it is better located than the other. As far as trails we’re looking to hit as many waterfalls as possible and make some time for hiking and getting to see a few fire towers. “Carwash Falls” is the only thing I’ve ID’d as a “must do” but it sounds like the Ozarks are like... 90% waterfalls... so that’ll be cool. In my usual “putting the cart before the horse” I’ve already started designing the trip stickers. This will be a non-TQ mini trip sticker, which is currently a rectangular 2x3" sticker with a cryptic icon and year. Anyway, I’ve got plenty of time to play with the design before the trip. Anyone have tips on how to get a roof basket or bull bar on the cheap? Any suggestions on how to make this trip a success? Tips on overlanding with doggo?